Customer success is not simply a vendor strategy; it’s what should happen after customers buy your software. When customers buy or subscribe to your product, they have expectations about how the product will help them with their business. They view your product as a tool to drive their business forward — a means to a business end. Larger businesses are likely to have software professionals to design, develop, and product-manage complex software applications. Smaller companies may not have dedicated software professionals. In nearly all cases, customers will seek assistance and resources from the product vendor at some point to help use and apply the product. When thinking about the services you provide to customers, it is important to understand what they are trying to accomplish from a business perspective, the skills and resources they have available to draw upon to reach these goals, and the role you as the software vendor will play. In an effort to understand what customer success looks like from the customer perspective, we conducted a study of software professionals responsible for managing, implementing, or administering software-based initiatives within a business environment. Our goal is to understand the extent to which customers feel prepared to use and apply your products and to learn what services and resources they need from you to be successful. Eighty-two percent of software professionals we surveyed indicate that they have an expert or advanced level of proficiency with the product they are primarily responsible for working with. These skills are attributed to resources provided by the vendor. Customers indicate they developed their skills through formal training provided by the vendor as well as by accessing self-help resources including product documentation and assistance and how-to videos. 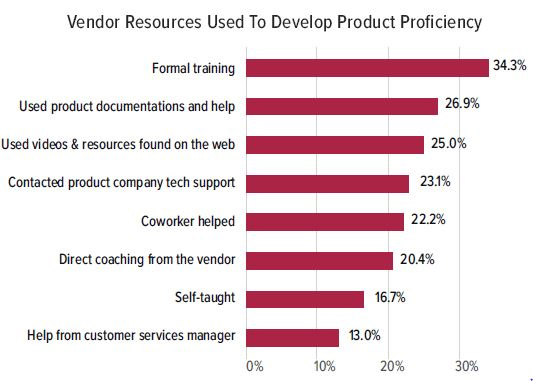 Nearly a quarter of customers indicate that they used technical support as a means to develop their skills. Fewer relied on help from account management resources. Customers indicate that they want more training, extended access to technical support, and more personalized coaching to expand skills. More than half (58 percent) of customers indicate that they received a personal call to introduce them to the service resources available to help them with the product. This means that 42 percent did not hear from the vendor that sold the product after the purchase. Sixty percent of customers relied on online self-help guides to install and configure their software, while 46.6 percent took advantage of live assistance. Customers indicate that they also sought design and architectural advice (what and how to build applications) and on-site assistance (39.7 percent). Customers indicate that the online guides and technical support were the most effective resources for helping get applications installed and set up. Only a third of customers indicate access to services designed to help drive adoption. 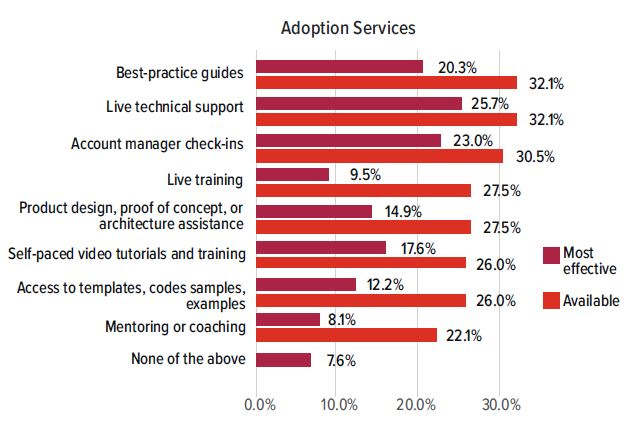 The most commonly available adoption resources offered were access to best-practice guides and live technical support and account managers. Customers indicate that live technical support and access to account managers are the most effective resources for driving product adoption. WHAT MORE CAN WE DO TO MAKE CUSTOMERS SUCCESSFUL? Customers indicate they believe they have a high level of product proficiency, but continue to look to vendors to provide access to technical expertise and product know-how. Customers welcome self-help resources — guides, videos, etc. — but can benefit from guided assistance to drive greater adoption and success. High-touch services are not widely accessed by customers, nor are they highly rated above self-help resources provided. The majority of customers surveyed indicate that they have been largely successful in adopting and using products, but there is still room for improvement. While 73 percent of customers indicate that they have met expectations with their products, that means a quarter of customers have not. Even customers who indicate success may still be interested in expanded use and impact from their technology investments. Continually helping customers to drive benefit from their investments is critical to sustaining and growing long-term customer relationships. 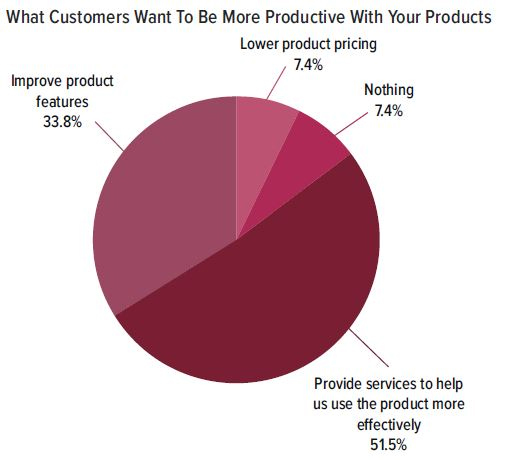 When asked, the majority of customers want more services to help them use your products more effectively. The key is to understand what services they need and to develop support and success offerings aligned with these needs. 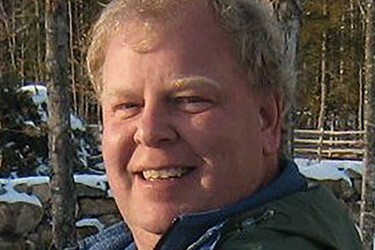 TOM SWEENY is the founder and principal of ServiceXRG. He leads research initiatives and publishes extensively about service industry trends and best practices. He helps companies develop and execute service strategies to strengthen customer relationships and optimize financial performance.